Do I Snore? How Do You Know If You Snore? Do I really snore? How can I tell if I snore? These are a couple questions that you may ask yourself if you suspect that you have a snoring problem. Perhaps your bed partner or roommate is always complaining that your snoring disrupts their sleep. Maybe you are simply curious as to whether or not you snore. Whatever the reason, you want to get to the bottom of what goes on after your head hits the pillow and you fall asleep. You’re not going to be able to figure out if you are snoring by yourself. You will need help from either a partner or technology. The first and most obvious way to tell if you snore is to ask your partner to listen as you sleep. If your snoring is loud enough, they probably already informed you without having to ask. If you do snore, have them note the position in which you are sleeping and the intensity of your snoring. Be sure to also keep a journal of activities such as drinking alcohol or eating before bed which can impact snoring. If you don’t have a bed partner, ask a close friend or family member to stay the night with you and observe you for the presence of snoring. While this may seem like an odd request, you will be glad you asked, especially if you find out that your snoring is a symptom of sleep apnea which is a serious condition that requires medical attention. If you are not able to find anyone willing to help you (or are too embarrassed), you can turn to technology to lend a hand. Smartphones can be an excellent tool for identifying a snoring problem. 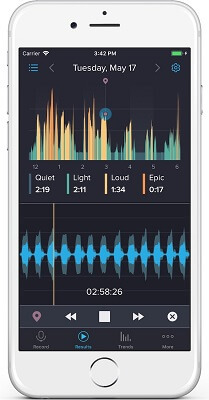 There are a number of different apps, many that are free, which can listen for snoring and record it so that you can hear it the next day. There are even specialized apps that are able to differentiate the sound of snoring from other bedroom noises. These specialized apps will often assign a score to your snoring which helps to quantify it. You can then take corrective action and compare the score from before and after. While there are only two ways to know for certain that you snore, there are a few daytime symptoms that you may notice which can offer a clue as to whether or not you snore. Daytime Tiredness: The first sign that you may notice is daytime tiredness. No matter how many hours of sleep you get the night before, you are tired and sluggish upon rising in the morning. Snoring can affect your quality of sleep, preventing you from achieving REM sleep which is necessary to rejuvenate the body and prepare it for the next day. A Sore Throat In the Morning: Having a sore throat in the morning may suggest snoring may be present. Most snorers sleep with their mouth open which allows air to pass through and dry out the mouth and airway. A dry mouth plus a uvula and soft palate that are tossed around as you snore are a recipe for a morning sore throat. Difficulty Concentrating: As mentioned, snoring can disrupt your sleep patterns and lead to daytime sleepiness. Due to the body not getting enough deep sleep to refresh itself, you may also notice a decline in your ability to concentrate. Are you having difficulty focusing on what you are doing or have a short attention span? Snoring may be the cause. Morning Headaches: Do you have an unexplained headache when you wake up in the morning. Does it frequently occur? Snoring may be to blame. Snoring is caused by a restricted airway. If you are unable to breathe properly at night, carbon dioxide builds up in the blood and affects the nervous system. This, in turn, can cause headaches in the morning. Morning headaches may also strongly suggest that sleep apnea is present. What To Do If I Snore? Snoring, in its benign form, can be harmless although disturbing your partner’s sleep is an issue that should be addressed. Snoring that’s related to sleep apnea should be addressed by a medical specialist who can treat this condition. Telling the difference between snoring itself and snoring as a sign of sleep apnea should be left up to a medical professional who is trained in sleep medicine. Once you are certain that your snoring is not related to Obstructive Sleep Apnea, there are a few remedies that you can try. First, avoid alcohol and sedatives before going to bed which can worsen snoring. Avoid sleeping on your back. Sleep on your side instead which will help to keep the airway free of obstruction. If you are overweight, try losing weight which helps by reducing the amount of fat around the airway. If snoring persists, you may want to consider the use of an oral appliance which can help by holding the jaw forward to help clear the airway and prevent the sound of snoring. Next post: Tomorrow Sleep Memory Foam Mattress Review – Is It Any Good? Previous post: How Long Does It Take For A Snoring Mouthpiece To Work?